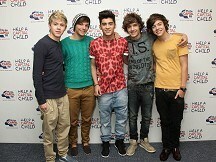 Heart-throbs One Direction are the dream dates for 2012 - after topping the calendar chart. The five-piece group are the highest new entry in the list of best-sellers as fans stock up for 2012, unseating last year's joint favourites Justin Bieber and Cheryl Cole. And it is bad news for Cole who has plummeted out of the top 10 entirely since slipping from view after leaving The X Factor. Bieber - who will be at the MTV Europe Awards in Belfast - has slipped down to third spot. Enduring singer Sir Cliff Richard is in second position - his highest spot for six years - showing off his slim frame at the age of 71. Cole's slip to number 11 means there is not a single female star in the top 10 of officially licensed calendars this year. The chart has been compiled by calendar firm Danilo in conjunction with retailer HMV and includes sales for other retailers such as Clintons and Amazon. Other acts making their debut in the chart - alongside former X Factor stars One Direction - include Moshi Monsters at number nine and Vampire Diaries at 10. Elvis Presley returns to the top 10 for the first time since 2002. Gennaro Castaldo, of HMV, said: "It's shaping up to be a One Direction Christmas." George Michael will show he has put his feud with Sir Elton John behind him when he performs a special gig to raise money for the singer's Aids Foundation. The two original members of the rock band The Who have launched a programme for teenagers and young adults with cancer in Los Angeles. Justin Bieber is denying allegations he fathered a child and says he has never met the woman who filed the paternity suit against him. Amy Winehouse's mother has said her "only comfort" is the thought that her daughter died a peaceful death. Heavy metal band GWAR are mourning the death of their lead guitarist, who has been found dead on their tour bus. Lady Antebellum reckon the reason they have succeeded where other country acts have failed and found success in Britain is by keeping things simple.